There you are, totally weightless, quietly soaring just above the sea floor with only the smallest amount of physical exertion. Being underwater can calm your soul, letting you enjoy the wonderful scenes that only can be found under the rippling waves of the sea. You will be picked up from your hotel in Waikiki in an air conditioned 10 passenger vans and transported to the dive shop, only a ten minute ride. Once at the dive shop you will meet your scuba Instructor for the day and be personally fitted with all the required scuba equipment that you will need. Next, is a five minute ride to the boat harbor where you will meet the captain and board the custom 37 foot dive vessel. The boat departs the dock and makes the short run to the days first dive site. While underway the dive instructor will brief you on the days activity. Going into detail about the site you will be diving, the water conditions for the day and what marine life you can expect to see. Endemic tropical fish, octopus and the Hawaiian green sea turtle are not uncommon sites. Once you arrive at the dive site your instructor will assist you in donning your scuba equipment. Your instructor will then take you on a guided tour of Hawaii's underwater landscape. 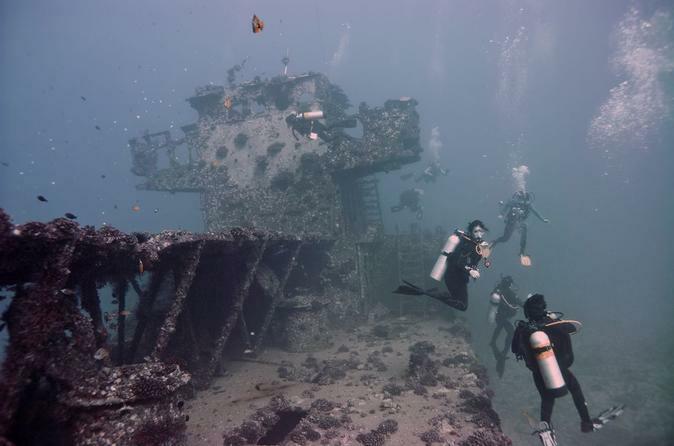 Marvel as you fly weightless through the water over colorful coral reefs teeming with beautiful marine life or swim through the majestic remains of one of Oahu's many sunken wrecks.